Welcome to our Summer issue of The eBullet! There's a lot of exciting things happening around Mayberry, so we'll just jump right in. * Now: Waitress, an award-winning film featuring Andy Griffith, is in release in theaters. It has been out a while now, so catch it while you still can. There's early Oscar buzz about Andy's performance! * Now: New release of the Second Season of "Gomer Pyle, U.S.M.C." We are shipping now at Weaver's Dept. Store. * July 16-22: Ronnie Schell performs at the Improv Comedy Room at Harrah's Hotel and Casino in Las Vegas. * July 19: James Best sinks his choppers into the Woodchucks baseball fame in Wausau, Wis.
* July 21: James Best rides a wave into the Riverbats baseball game in St. Cloud, Minn.
* July 21: Jackie Joseph (Ernest T. Bass' girlfriend Romeena) is the Special Guest of Honor for the 7th Annual Mayberry Squad Car Nationals in conjunction with the 3rd Annual Mayberry Comes to Graysville festival in Graysville, Ala. (just north of Birmingham). Also on hand will be tribute artists, including David "Mayberry Deputy" Browning, Allan "Floyd" Newsome, Tim "Goober" Pettigrew, Jamie "Opie" Sullivan, Kenneth "Otis" Junkin, and any number of Ernest T. Bass wannabes hoping to "heft" Romeena. There will even be a tribute artist for Ellen Brown, the lady manicurist! And of course there will be lots of Mayberry Squad Car replicas from several states participating in the morning Parade (free) beginning at 10 a.m. on Main Street in downtown Graysville and then the Nationals Obstacle Course Race (free) at 11 a.m. at the ball field/unofficial raceway (watch your back, Talladega!) at the Graysville Community Center. * Q&A with Jackie Joseph and screenings of "My Fair Ernest T. Bass" and other special films beginning around 1 p.m.
* In the evening, there will be a barbecue buffet dinner at 5 p.m., followed immediately by the Tip-Top Talent Show hosted by David Browning and featuring music by Mid-Life Crisis beginning about 6:15 p.m. The Mayberry Squad Nationals is organized by TAGSRWC's "Hearty Eatin' Men and Beautiful, Delicate Women" chapter (Tuscaloosa, Ala.). Mayberry Comes to Graysville is sponsored and hosted by the City of Graysville, Ala., in association with Graysville's Mayberry Minutemen chapter of TAGSRWC. Supporting sponsors include Diversity Brands, makers of Mayberry's Finest packaged foods; Walgreens, Graysville City Attorney Greg Morris, and TAGSRWC. The sponsoring hotel is the Best Western in neighboring Gardendale, Ala.
* July 31: Doug and Rodney Dillard appear in a parade and perform at the Odon Old Settlers Festival in downtown Odon, Ind. * Aug. 3: David Browning will be getting guitar sounds, banjo sounds and who knows what all out of his jug of tricks for the Macon (Ga.) Music baseball game. * Aug. 10: It's no cliff-hanger to know who's back in town for the Salem (Va.) Avalanche baseball game. * Aug. 11: "A Night in Mayberry" starring Darlings Maggie Peterson Mancuso, Doug Dillard, and Rodney Dillard at 7:00 p.m. at the James Garner Center in Troy, N.C. The fundraiser for DARE also features Mayberry tribute artists, including David "Mayberry Deputy" Browning, Kenneth "Otis" Junkin, Jamie "Opie" Sullivan, Allan "Floyd" Newsome, and Jeff "Howard" Branch. Reserved seats are available in advance for $20 by calling (704) 985-6987. General Admission tickets will be available at the door for $15. 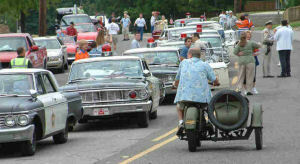 * Sept. 27-30: 18th Annual Mayberry Days in Mount Airy, N.C. For tickets and more info, visit http://www.surryarts.org/. Andy Griffith and his new movie, Waitress (now showing in theaters nationwide), continue to draw solid audiences and outstanding reviews. Andy also provides the voice of Santa Claus in the animated Christmas Is Here Again, which will be released in November. The film has an all-star cast including Ed Asner, Shirley Jones, Kathy Bates, Norm MacDonald, Brad Garrett, Dan Roebuck (who also is one of the producers), and Jay Leno as the narrator. Ron Howard is in preproduction as director for the film version of Frost/Nixon, the hit play about David Frost's interviews with Richard Nixon after he resigned. Jim Nabors had to cancel his traditional appearance at the Indy 500 (and a couple of summer concert dates) because of illness. Through the magic of satellite television, the thousands of race fans at the Brickyard sang "Back Home in Indiana" for Jim as he recuperated back home in Hawaii. George Lindsey has been enjoying a relaxing summer while the "Find Me a Man Like Goober" music video by country duo Moore & Moore continues to get play on a solid range of outlets. He also attended one day of CMA MusicFest, where he joined pal Ralph Emery in greeting fans and signing autographs. Betty Lynn was an invited guest for the private dedication ceremony of the Billy Graham Library in Charlotte, N.C., at the end of May. Former President Jimmy Carter was among the speakers. Betty returns to Charlotte this month for the Western Film Fair. 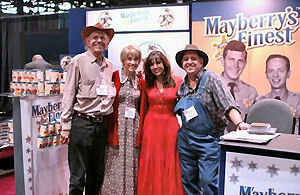 FINEST TIME-Doug Dillard, Maggie Peterson Mancuso, and Rodney Dillard visit with Diversity Brands President Marcela Gomez at the company's exhibit booth during the introduction of the Mayberry's Finest line of foods at the Food Marketing Institute trade show in Chicago in May. Mitch Jayne's fascinating new novel, Fiddler's Ghost, is being released during the next few weeks (you can see the book's cover in the Merchandise section below). It's great reading for anybody who loves a good ghost story, music, skillful writing, or just plain great storytelling from a true master. James Best has had a busy summer of personal appearances, including DukesFest in Nashville. He's also managed to find plenty of time for fishing. You can check his personal appearance schedule to get an idea of where some of the fishing spots are that he has been hitting. James plays McClancy in Moondance Alexander, which will be in theaters nationwide this fall. The film, written and produced by James' daughter, Janeen, and her husband, Michael Damian (who also directed), has already won an award at April's Newport Beach Film Festival. Margaret Kerry (Bess Muggins in "Christmas Story" and Helen Scobey in "Andy Forecloses") has done more than 80 press interviews and has been on a press tour to New York, Toronto, and London promoting a new Tinker Bell movie for Disney. She's also doing a Disney cruise to the western Caribbean in November. And her memoirs, Tinker Bell Talks: Tales of a Pixie-Dusted Life are scheduled to be published in the next six months or so. We're sad to report that legendary actor Charles Lane, who played moonshining butter-and-egg man Mr. Frisbie in "Aunt Bee the Crusader" (Episode #111), died on July 9 from, well, from being 102. He died at his home in Brentwood, Calif. He was born Charles Levison on January 26, 1905, over a year before the Great San Francisco Earthquake. He started out as an insurance salesman, but moved on to the famed Pasadena Playhouse and then into films. He was a founding member of the Screen Actors Guild. His first film was Smart Money in 1931 with Edward G. Robinson and James Cagney. By the time he shot It's a Wonderful Life for favorite director Frank Capra in 1946, he had already appeared in about 200 films (He would go on to perform in eight Capra pictures.) It's very possible that his combined total number of movie appearances and guest appearances in scripted TV episodes is more than for any other actor between the 1930s and 1970s. Among his movies were The Ghost and Mr. Chicken with Don Knotts. He was also in two episodes of "Gomer Pyle, U.S.M.C." He is perhaps best remembered as feisty (that goes without saying!) Homer Bedloe in "Petticoat Junction" and also as Foster Phinney in episodes of "The Beverly Hillbillies." Charles Lane's last on-camera film performance was in 1995. He also narrated the short The Night Before Christmas in 2006. 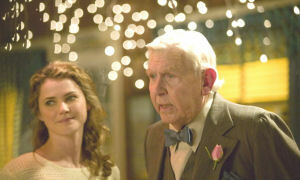 And he was in attendance at the TV Land Awards in 2005 when he was honored for his 100th birthday. His wife of over seven decades, actress Ruth Covell, passed away in 2002. He is survived by son Tom and daughter Alice. Donations in his memory may be made to the Motion Picture & Television Fund or another charity. Editor's Note: Don't hold us to this as definite fact, but we believe that Charles Lane is so far second the longest lived person to have worked on TAGS. We believe the longest lived was Lillian Culver (Barney's mother in "The Manhunt.) She died in 1999 at the age of 103 1/2. Ol' Ben Weaver's brow sweats when he thinks about everybody in Mayberry having fun as they learn to wheel and deal in business the way he does. But he'll get over it. This game seems destined to become a valued collectible years from now. 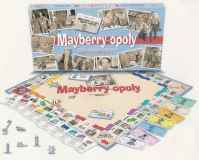 In the meantime, enjoy hours for Mayberry fun actually playing the game. We think it's the most fun opoly game ever created. It's even fun to lose! 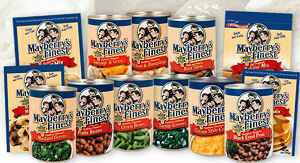 The exciting new Mayberry's Finest line of packaged foods from Diversity Brands won't be on our shelves at Weaver's Dept. Store (only because we're not exactly set up for shipping cans of beans and jars of pickles), but they will be hitting the shelves of grocery stores across the country during the next few weeks. Keep an eye out for them at your favorite store. And there's also going to be a recipe contest later this fall. Who knows...your recipe (and your picture) just might be the winner selected to be on (the inside of) a label. 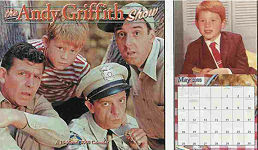 Check out the Mayberry's Finest Web site at http://www.mayberrysfinest.com. "Still Ugly, Single, and Pitting Prunes"
That brings our total number of chapters founded to 1,314. If you're interested in starting a chapter of TAGSRWC, all you need to do is pick a name that has not already been chosen, and submit it with a list of your founding members by postal mail. As bunches of chapters join other members and fans in preparing for this month's Mayberry Squad Car Nationals in Graysville, Ala., we have light Chapter News this issue. Trivial Trivialities (Georgetown, S.C.) is working on putting a gathering together with nearby chapters. Mayberry chapter (Knoxville, Tenn.) continues to meet regularly for a variety of activities, ranging from bowling to parades. They publish their excellent Mayberry Minutes newsletter three times per year. Barney chapter (Greensboro, N.C.) is still meeting every month. A recent meeting had them on a short road trip to Graham, N.C., to see a hometown exhibit honoring chapter member Jeanne Robertson, a former Miss North Carolina. Members of "What Are We Going to Do, Andy?" (Jacksonville, Ill.) and Mavis Neff (Durham, N.C.) are among chapters that have visited Nashville, our headquarters town, this summer. And that's it for Chapter News this time. See? We weren't kidding when we said it was going to be light! Old Lady Crump crosscut us with a slippery question in the first question and a real test for "trained noticers" in the second question, but many entries came through unscathed (and just as many didn't). When the dust settled, we drew a name from among all of the completely correct entries. The winner is Louisiana's Eric Marshall. Attaboy, Eric! He gets his choice of any single item (except box sets of DVDs and sets of buildings; we "aint' no Rockefeller"). 1. Four different animals seen in Mayberry that Mayberrians either appear to believe can speak English or else mistakenly believe are actually human include. Goober's dog, Spot, in "A Man's Best Friend"; the goldfish that Barney listens to in "Opie the Birdman"; Jimmy the goat that Otis thinks is his Uncle Nat in "The Loaded Goat"; silver carp Old Sam in "Big Fish in a Small Town" (though it's not clear that Old Sam was supposed to be speaking English or that anybody really believed he could talk); the rabbit in the bushes that Barney thinks is escaped convict Eddie Brooke; and the cows that are mistaken for being Baker and Charlie in "The Cow Thief." It's not so much that Miss Crump is being lazy over her summer break, but she thought maybe the quiz-takers would enjoy a simpler quiz. She has prepared just one question for this quiz. It's sort of a Summer Reading List quiz. The person whose quiz has the required correct answers will receive his or her choice of any single item offered online at Weaver's. (Neither a boxed set of TAGS DVDs nor a set of Wooden Mayberry Building Fronts is considered a single item. Neither are sets of tin signs and combos.) If there is more than one person with the most required answers (as is usually the case), we'll draw a winner from all the top entries. Submit your answers by e-mail to OldLadyCrump@iMayberry.com or, if you're like Stan Nicholson and don't trust a computer with your entry, mail your answers to TAGSRWC, 9 Music Square South, PMB 146, Nashville TN 37203-3211. All entries must be e-mailed or postmarked by Sept. 1, 2007. Happy watching about reading! The next issue of The eBullet is scheduled for mid-September, with a Weaver's Newsletter planned for August.